Financial institutions, particularly regional banks and credit unions, face challenges both in terms of safeguarding data and meeting compliance. Cybercriminals are ramping up their attacks and large enterprises are establishing and staffing the security operations centers (SOCs) needed to combat them. But what are the options for smaller organizations that don’t have the resources to build and manage a SOC, and lack the expert security engineers required to staff them? 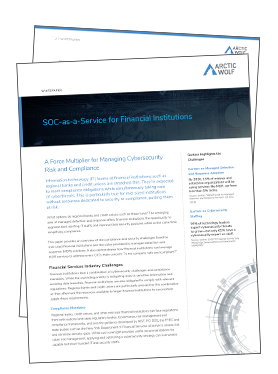 Find out how your financial institution can withstand even the most dangerous cyberattacks while also fulfilling compliance requirements. Download the white paper today!